I love fashion, beauty, food, books, traveling and babies so that's what this blog is mostly about. I'm an Independent Herbalife Distributor. Shoot me an email at iza_mirilyea@yahoo.com if you want more info about it. Being pregnant is amazing. I don't know about you, but I enjoyed being pregnant (well, most of the time). 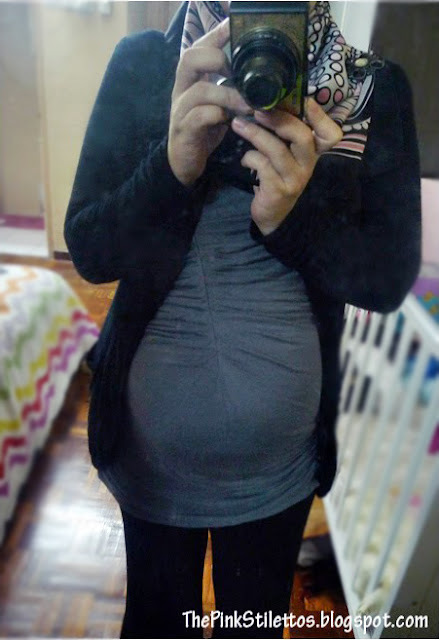 Hello, bump. Long time no see! ....and knowing that you're carrying a new life inside of you! I think it's important to have a happy pregnancy. I've read here that there's a correlation between a mother's emotional life while pregnant and the later personality of her child (my mom also said the same thing). Mothers who have less anxious pregnancies, whose babies were wanted and loved tend to have emotionally healthy children. Mothers who resented being pregnant and felt no attachment to their babies are more likely to have children with emotional problems. So it's important to bond with your baby from the very beginning - right from inside the womb. Talk to your baby (I didn't do this tho, because it felt weird, like I'm talking to myself), read to your baby (now this, I did), recite Quran, play soothing music and Quran recitation, and ask your husband to talk to your baby too. Sometimes babies respond by kicking and moving around. Such a precious moment! Eating healthy food is also another way to bond because you're sharing food with your baby! The nutrients will be absorbed and passed on to your baby to support her healthy growth so make sure you eat right and take your vitamins and supplements. But if you have a poor digestion, you may not be absorbing all the nutrients that your baby needs. The New Anmum Materna with Probio DR10 and Prebiotic helps to support a good digestive system for better nutrients absorption. Probio DR10 is a type of probiotic originated from yogurt and they are the good bacterias that provide us with digestive system benefits. Prebiotic, on the other hand, is "food" for Probiotics, which supports their growth. Prebiotic, like Inulin in Anmum Materna is originated from plant, which is also a source of dietary fibre. 2 glasses of Anmum Materna is loaded with 100% folate, gangliosides + DHA, calcium and iron to support your baby's development and your well being. Not only Anmum Materna is good for pregnant women, it's also suitable for women who are planning to get pregnant. 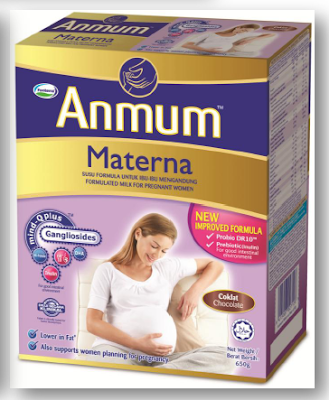 You only need 2 glasses of Anmum Materna a day to get the important nutrients to prepare your body for pregnancy. I made these cupcakes out of boredom yesterday. These are actually buttermilk skillet cake, but instead of using a skillet (or a cake pan like I did some time ago), I turned them into cupcakes. I don't know about you, but I think cupcakes are better than cake. I'm not 100% sure why but if I had to choose between a slice of cake (say, Red Velvet) or a Red Velvet cupcake, I would definitely choose the latter. It's like the perfect little treat! You don't need a plate and a fork to eat it. And it's easier for little hands! I followed Joy The Baker cookbook for the buttermilk cake recipe. The cake is fluffy and light. And it's not too sweet. I like! But this time, instead of walnut praline topping, I decided to make something simple... and chocolatey. Chocolate ganache! About 100g of semisweet chocolate (that has been chopped) and 1/4 cup of heavy cream are melted in a double boiler until you get a smooth chocolate mixture. Let it cool down a little. Dip a small spoon into the chocolate mixture and drizzle it all over the cupcakes. Make a swirl, zig-zag, circles, X... whatever you want. Don't worry about making comot cupcakes. They're supposed to be that way! For us: plain buttermilk cupcake with chocolate ganache and chopped almond topping. For the kids: chocolate chip buttermilk cupcakes dipped in chocolate ganache. Yes, we deserve a sweet chocolatey treat once in a while! I had 3 cupcakes and nothing else for dinner that night. And I was a happy camper (as long as I stayed away from the weighing scale). We're not planning to have another baby just yet, but I was surprised when somebody told me that a woman's diet can determine the gender of her baby. Did you know that? There's actually a girly and boyish food! I was told that red meat = boy, fish = girl. No wonder I have two girls! Fish has always been my favorite. Yes, men are the ones who produce the gender-determining sperms (X and Y chromosomes) but we women are somehow responsible to create a "hospitable" environment for the chromosomes to thrive. According to my readings, a woman's diet determines her vaginal pH and acidity levels. A high vaginal pH level enables you to conceive a baby girl, while a low vaginal pH level enables you to conceive a baby boy (you can read more here). So if you want a baby girl, eat acidic food. If you want a baby boy, eat alcaline-rich food. Acidic, high in calcium and magnesium. Low in sodium, potassium and caffeine. Alcaline, high in potassium and sodium. I also read that a high calorie diet is a must to conceive a baby boy. Red meats, potatoes, bananas, asparagus, broccoli, nuts, mushrooms, salty food like potato chips, salty peanuts, etc. I don't know how accurate is this, but I remember eating a lot of fish, pasta, green leafy veggies and dairy products for the past few years. I don't like coffee and I rarely eat meat and steak. Those are all girly food! What about you mommies? Do you remember what food you ate the most when you were conceiving? Is the "outcome" the same as this theory? Now that I already have 2 girls, I would like to have a boy next (whenever that is). I need to eat more meat! I need to eat boyish food.... Perhaps something like this. It may not be 100% accurate, but it doesn't hurt to try! 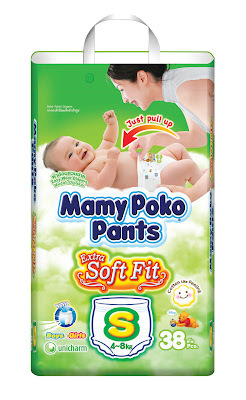 I just found out that MamyPoko Pants Extra Soft Fit now comes in S size as well (previously size M-XXL)! 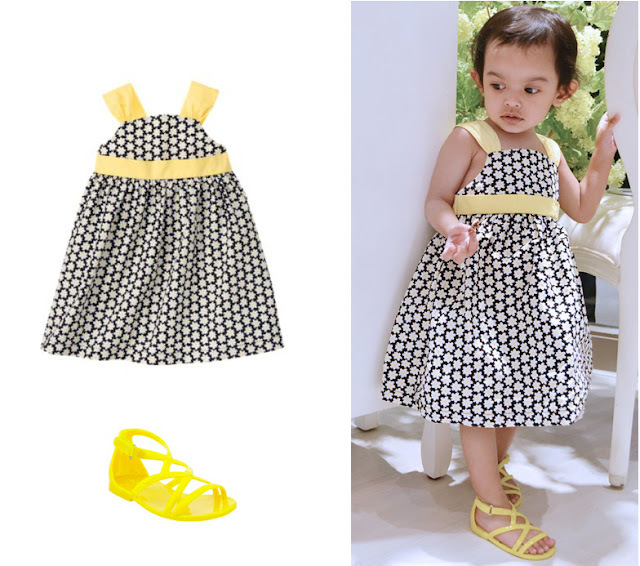 It's suitable for kicking babies, aged 2 months and above, or even petite babies (Raina was still wearing S size diapers at 6 months old!). This diaper pants have saved me so much hassle especially during outings and traveling, because it is designed to be easy to wear - like pants! Definitely on top of my must-have baby items. Does it make any sense to crave for something inedible? It does, doesn't it? Because right now, I am craving for these. I love Kate Spade. 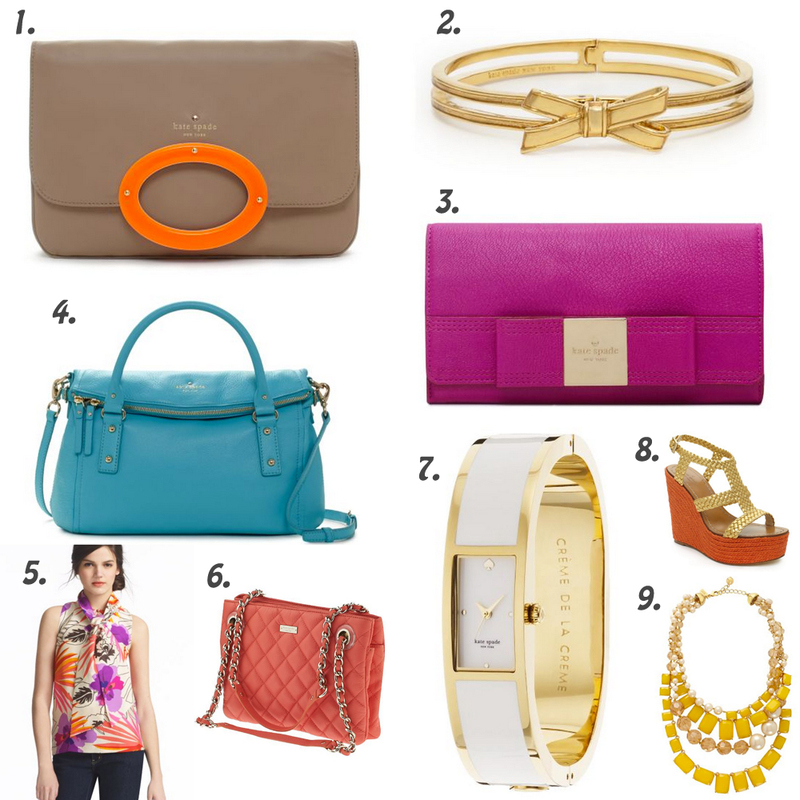 Everything from Kate Spade is fun, chic and colorful. Even their paper bags and boxes are colorful. Major love! When I first got the invitation to Trudy & Teddy's first boutique opening, I was puzzled. And then I realized something. Boutique - as in their own store! Not in department stores like all these whiles. How awesome! I couldn't wait to see the interior of the boutique. I imagined there'll be lots of cream and pastel colors and wallpapers. Something classic European, just like their line of clothing. I fell in love with their boutique, the moment I stepped inside. It's so nice! I love the deco, the ambiance, the choice of colors, everything. Feels like a high-end boutique. The sales assistants even wear aprons! If I didn't know Trudy & Teddy brand and I happened to pass by the boutique for the first time, I would think it's a really expensive brands for children. And I wouldn't even think it's a local brand! Did I mention that I went to this event with my girls and without my husband? That was the first time. And probably the last! Haha. and make a new friend. ...because it was done by Trudy & Teddy's little ambassadors! Thank God Thara from Nuffnang was there. She babysat Raina for awhile while I did a little shopping (she bribed her with her necklace and bangles!). Each of us received a door gift, which consists of a dress up story board book (with all the characters wearing Trudy & Teddy collection - how cute is that? ), a bookmark for free gift redemption and RM50 cash voucher! I redeemed the voucher straight away and got my girls these gorgeous dresses. The picture doesn't do it justice. They are more beautiful in person! Perfect for special occasions. 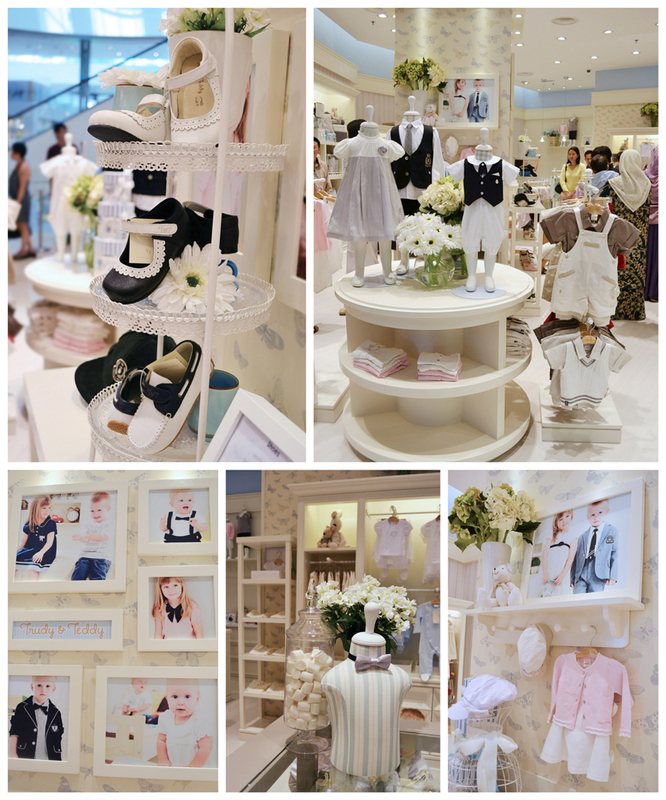 Trudy & Teddy boutique offers a spacious and relaxing shopping ambiance, with the most complete Trudy & Teddy's collection. They even have bedding sets for babycots! Check out their one and only boutique (at least for now) at Lot 5.42.00, Level 5, Pavilion KL. Went to the Mom & Baby Expo at Mid Valley Exhibition Centre earlier today. We arrived at around 2-ish and it was already crowded with people (no surprise there)! Headed straight to MamyPoko booth. Thank God the booth is located in front of the registration counter (Hall 3), which is not far away from the main entrance. Malas nak berasak-asak - what with the kids, double stroller and everything. Ayra has ran out of the Extra Soft Fit diapers (very convenient for travelling and outing) so I bought a few packs of those and a pack of MamyPoko Unscented Gentle Cleansing Wipes. All those for only RM64. Didn't buy any diapers for Raina coz she still has about 6 packs of both diapers (Stripes Pad and Extra Soft Fit) at home. The expo ends tomorrow (13th May) - there's still time to stock up if you haven't! Old Navy gladiator jelly sandals. Loving the pop of yellow! I posted a photo of my makeup organizer on Instagram some time ago and received so many questions about it (sorry if I didn't reply to any of your messages!) that I thought of doing a special post just for it. Buttt! I have to warn you. My makeup collection is rather boring. I don't have 20 different kinds of eyeshadow palettes and a gazillion lipsticks and mascaras like any other makeup junkies. I mean, I love makeup but I am not a makeup hoarder. I only buy what I really need (now if only that applies to clothes as well). So don't expect too much, okay! Alright, so I used to stash all of my makeup items in the storage at the back of the mirror of my dressing table, that looks something like this. Yes, my makeup was safe from my kids' reach - I even secured the mirror with a safety strap, just in case - but the storage is too narrow and I kept on dropping my stuff. Grrrr! Do you know how agonizing it is to drop a makeup item and see it broken into a million pieces - especially new ones?? Happened quite recently to my Nars blush (I still keep and use it of course). I just had to find a new way to store my makeup. So then I found this acrylic makeup organizer on eBay. It comes in different types and sizes, and I bought mine for about $52 (free shipping) from this Korean seller. Mine is the B-3 (b tape) type, which, as you can see, comes with drawers and open compartments - small ones for lipsticks/lip glosses, bigger ones for bigger makeup items like foundations and powders. It's just perfect to hold all of my makeup and I was very pleased with my purchase. Shipping was fast too - my item arrived about a week after I've made the payment. I like that each of the drawers comes with a liner so that they won't get scratched. I loveee my makeup organizer so much (can't help to stare at it all day) that I decided to get another one (also from the same seller) for the rest of my beauty stuff. I bought the ST-823, which comes with 2 compartments with lids. Perfect to store facial cottons and cotton buds! and there's still some room for more. Oh, in case you're wondering what are those white tubes covering my brushes... Those are brush guards which helps to protect your makeup brushes so that they don't get squashed. I bought them from CoastalScents.com (yes, they ship to Malaysia). Besides lipsticks/lip glosses, these small compartments are perfect to hold skincare/makeup sample tubes too. 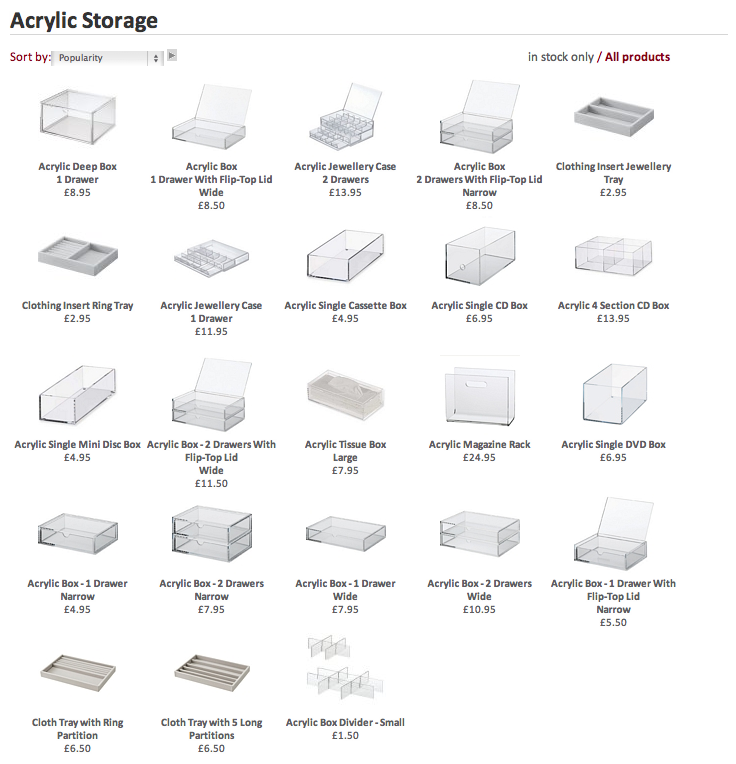 You can also get this kind of acrylic storage at Muji store in Pavilion (level 5, if I'm not mistaken). It's my new favorite store! They're not exactly the same like the ones I bought from eBay (no lipstick holder) but they would make a nice storage for makeup too. I bought the 2-drawer box and jewellery trays (sold separately) for my brooches. Love it! You can even use it to store your makeup items - without the trays, of course. So that's how I store my makeup (and skincare and brooches). Would love to know how you store yours, especially those with little kids!